Lightly sweet, mostly dry, and bursting with bubbles, a naturally fermented lemonade soda is one of our favorite probiotic treats to make – particularly in summer when it helps to quench thirst brought on by hot days spent under the sun’s bright and warm rays. 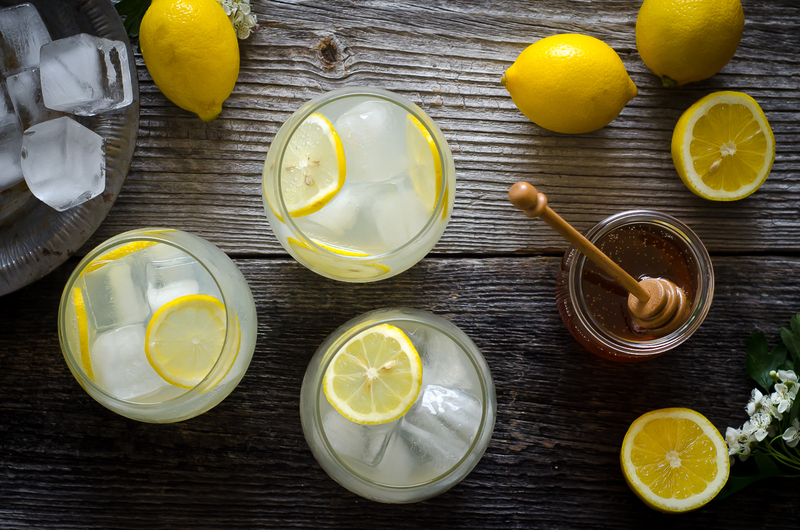 Homemade, naturally fermented lemonade is also easy to make. It involves less than five minutes of active time in the kitchen, mostly spent stirring before bottling and waiting for friendly bacteria to do the work for you. It is also a great way to introduce kids to gut-friendly fermented foods. This homemade, naturally fermented lemonade soda’s fizz depends on the action of friendly bacteria. They gobble up the carbohydrates in the honey. In the end, those bacteria make your natural sodas less sweet, slightly more tart, rich in B vitamins and naturally fizzy. The natural fizz comes from the release carbon dioxide that happens during fermentation. When carbon dioxide is bottled up with no place to go in flip-top bottles, the lemonade becomes naturally fizzy. 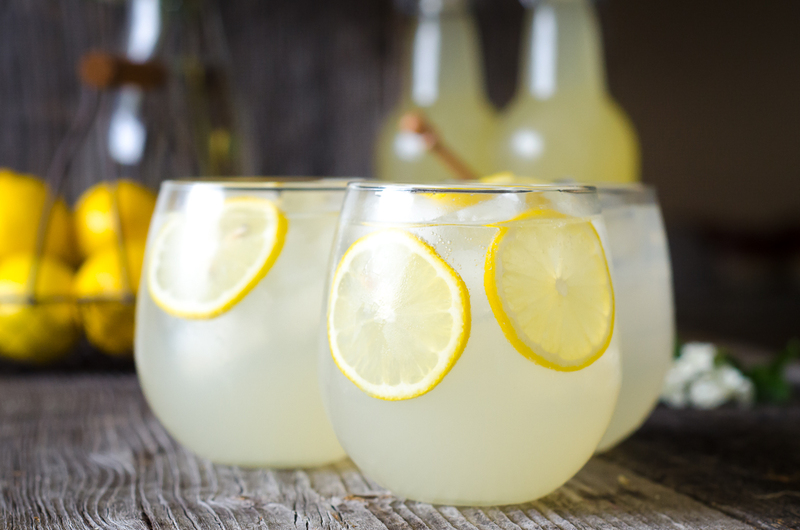 Depending on how long you allow the lemonade to ferment, that fizziness can range from an effervescent tickle to a frenzied foaming. This naturally fermented lemonade soda is loaded with probiotics that give it its characteristic fizz and foam. 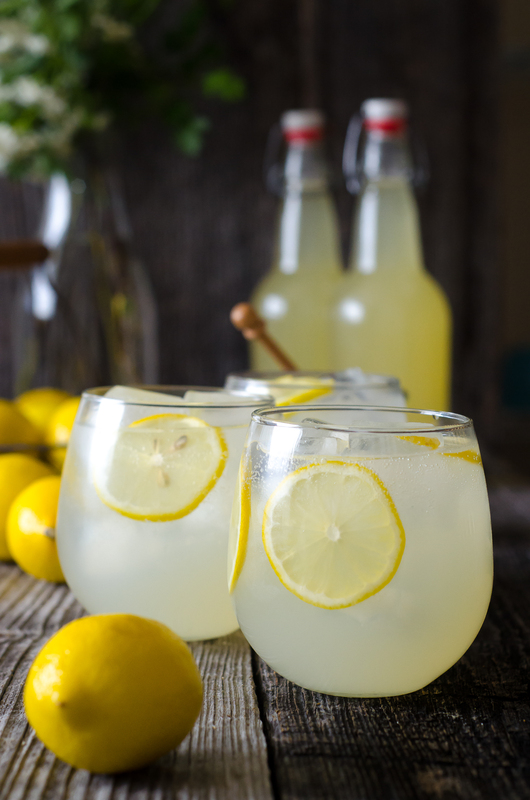 A dryer soda, the lemonade is only slightly sweet and notes of honey play well with lemon. Serve it over ice, garnished with fresh lemon slices. Warm the water in a saucepan over low heat, keeping it just warm enough to dissolve the honey - about 100 F. Whisk in the honey continuously until fully dissolved in the water. Turn off the heat, and remove the pot from the stove. Whisk the lemon juice and whey into the honey water until fully incorporated. Pour the lemonade through a narrow funnel (like this one) into three flip-top bottles (find them here). 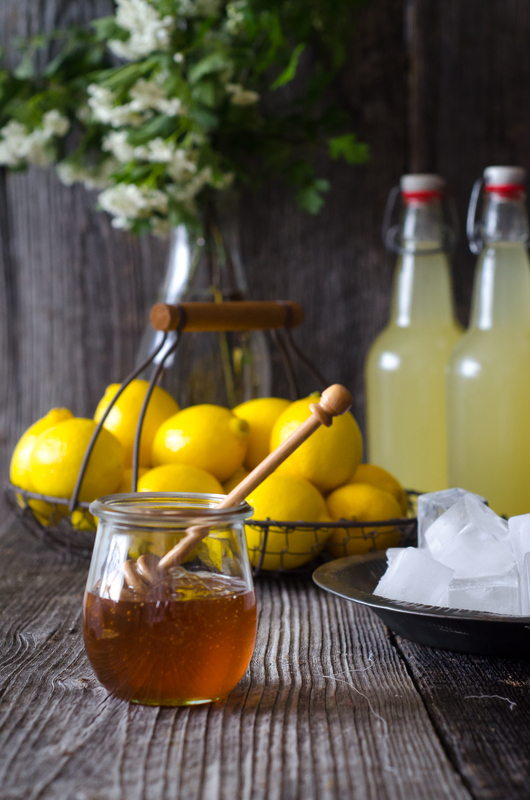 Seal the bottles, and allow the lemonade to sit at room temperature to ferment at least four and up to seven days. You can open a bottle to check for fizziness and flavor, keeping in mind that the warmer your kitchen and the more time you allow, the sourer and more fizzy your soda will be. Of course, the bacteria responsible for all the goodness of homemade sodas needs to come from somewhere, and, in the case of this fermented, probiotic lemonade soda recipe, they come from fresh whey. Fresh whey is the liquid that accumulates on top of your yogurt, and it is also the liquid leftover when you make homemade yogurt or milk kefir and strain it. This is how to make your own whey. You can also use kombucha tea, jun tea, water kefir or ginger bug in place of whey in this recipe. They’re all a good source of the friendly microbes you need to make homemade, fermented soda. Naturally fermented, probiotic drinks are easy to make, and fun to share. They’re also good for your gut – and loaded with beneficial, friendly bacteria. Lower in sugar, they’re a nice alternative to commercial sodas. Jun Tea is similar to kombucha, and a fizzy mix of honey-sweetened green tea. Kombucha Tea is made with black tea and sugar and can be flavored easily. We’re partial to this version with cinnamon and spice. Raspberry Ginger Soda is made with raspberries and ginger bug starter. Water Kefir is a naturally probiotic, and made with sugar, lemons and dried fruit and this version with cranberry and orange is fun. Excited to see this one. My daughter has been loving her kombucha, and a raspberry soda we made from whey. Hmm, might have to consider raspberry lemonade after I make sure I do this one right! I do have one question though. The last batch of soda I made from whey seemed to have a yeasty section that pushed out of the bottle before we got to the soda. I figured it could have been because my whey wasn’t clear (I think the kefir got past the strainer). Have you ever had this happen? When whey is cloudy, it’s just a sign that there’s more milk solids in the whey than when it’s clear. These milk solids can accumulate and rise to the top causing a foamy plug of sorts This, coupled with kefir’s natural yeast content, means that, from time to time, you’ll see a plug. It’s like the yeast accumulation in a bottle of kombucha – not bad or dangerous by any means – but it could be a texture issue, in which case straining it is the best option. Thank you. It still tasted great, but I’m rather glad for the confirmation. We’re making this recipe this weekend. Can’t wait to taste it! This sounds great, but honey is so expensive. I’m assuming I can achieve the same fermentation with sugar? You can try and let us know how it goes. Following. Ours was too sweet for our taste buds and the honey was a bit demanding. I am also curious about table sugar, or using less honey. I will probably try both. I not a fan of honey. Could I use agave? Hi Jan, I recommend making the recipe using the ingredients above. For what it’s worth, we’re not big fans of agave around here: https://nourishedkitchen.com/whats-your-take-on-agave-nectar/. That said, you might try it and see if it works for you. I made the soda exactly how you said and it turned out delicious. After 4 days it was fizzy so we chilled and opened a bottle. Wow, that stuff will always be in my frig. Thanks for a deliciously fun recipe. I’m anxious to try other variations. So glad you like it! Yes, it’s pretty easy to make variations. We tried a blackberry version recently that was amazing. I’m anxious to make the Ginger Raspberry soda. My Ginger Bug has been in the frig for 6 days and I have been adding to it each day as you said. How long before I can use it? Oops. I just reread the Ginger Bug recipe. I did not let it sit out, I have kept it in the frig all the time. I’ll start over and do better this time. Considering the huge amount of time and cost that goes into caring for a honey bee colony and harvesting the honey, I am certain that the public does not recognize the real value of raw, local honey! If they did, they would most certainly not claim that it’s too expensive! Im new to your site and all the fermented wonderfulness you make, and i want to get started, where do i get fresh whey? Hi Kathy, That process is described in the post above. Yes, in the post above I describe how you get fresh whey. I don’t know how I can be clearer about that. When you see anyone (me or anyone else) refer to kombucha, they’re referring to kombucha tea, and when you see them refer to a kombucha scoby or mother or mushroom, they’re referring to the scoby. Jenny. I followed you recipe exactly but on the third day mold began to grow on the surface what did o do wrong? First, are you certain it’s mold that you see? If you used whey, you will often see milk solids rise to the top of the bottle and form a creamy cap or bubble. It’s understandable that people confuse this with mold when it really isn’t. Second, did you use fresh lemon juice? Pasteurized, bottle lemon juice may have been the culprit. Third, was your whey fresh and was it from yogurt or kefir? Fourth, did you use flip-top bottles (and fill them to the neck?) If so, on how many did mold appear? Thank you for answering my question – for reference I never change a recipe until I have made it as is once. I made the whey from store bought yogurt. Not sure how to make it from Kefir since it is a liquid. Used fresh lemons – there was some pulp – should I have strained? Honey had to be heated because it had crystallized but I let it cool to room temp. Used the right bottles – in fact used your link to Amazon to order. The only thing I can think of from your reply had to do with filling the bottles all the way up. I did not go all the way to the top (perhaps 1/2″ left open). And yes it was definitely mold on all three bottles. Any other tips before I try again? How do I make whey from Kefir by the way? 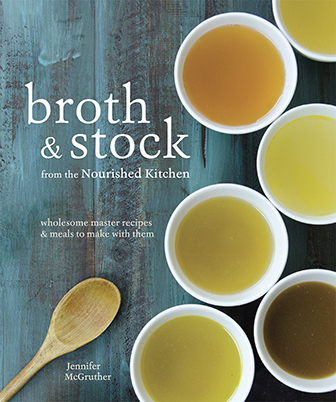 Can you shoot a picture to support@nourishedkitchen.com? way, how long can I keep this in the refrig after making? It sounds like you did everything by the book here, so I’m really stumped. Would love to have seen a photo to help me troubleshoot further. My only guess (and it’s just a guess at this point) is that the yogurt that you got the whey from may have been a little old or may not have had many live bacteria. We usually drink ours within about 10 days. It should keep longer, but I don’t have room in my fridge to test and see. We boiled our bottles for our second batch, because our first looked like it had mold. (Could have simply been yeast, but was black.) By starting the bottles upside down in a huge stock pot in room temperature water, and bringing them up to a boil SLOWLY, we had no glass shatter. We then let them in the rolling boil for about 20 minutes. The batch we made with these had only the solids that seemed to match the “color” of the rest of our beverage. It was so fizzy and yummy this time. That’s really interesting feedback, ML. Boiling equipment in advance is a great tip. you can also sterilize your bottles (without plastic/rubber parts) by placing them in an oven at 220 for 10 minutes. i let them cool in the oven till i’m ready to use them. Strain yogurt, the liquid left is whey. I will take your word for it, and try it ~ obviously, it’s working! So this means that… even though honey is antiseptic and antimicrobial, it actually feeds probiotics??? Honey has been widely accepted as food and medicine by all generations, traditions, and civilizations, both ancient and modern. For at least 2700 years, honey has been used by humans to treat a variety of ailments through topical application, but only recently have the antiseptic and antimicrobial properties of honey been discovered. Honey has been reported to be effective in a number of human pathologies. Clinical studies have demonstrated that application of honey to severely infected cutaneous wounds rapidly clears infection from the wound and improves tissue healing. A large number of in vitro and limited clinical studies have confirmed the broad-spectrum antimicrobial (antibacterial, antifungal, antiviral, and antimycobacterial) properties of honey, which may be attributed to the acidity (low pH), osmotic effect, high sugar concentration, presence of bacteriostatic and bactericidal factors (hydrogen peroxide, antioxidants, lysozyme, polyphenols, phenolic acids, flavonoids, methylglyoxal, and bee peptides), and increase in cytokine release, and to immune modulating and anti-inflammatory properties of honey; the antimicrobial action involves several mechanisms. Despite a large amount of data confirming the antimicrobial activity of honey, there are no studies that support the systemic use of honey as an antibacterial agent. It’s a common misconception that honey can’t be used in fermentation, and it is often repeated. Honey is antimicrobial due to its low water content (so are sugar and salt), as soon as you increase that water content, honey will support the proliferation of bacteria. If honey killed bacteria and negatively affected fermentation the world wouldn’t have Mead, Sima (Finnish Lemon and Honey Beer), T’ej (Ethiopian Honey Wine), Jun (a ferment of green tea and honey). Where do I get whey? And if using ginger bug instead , how much? How to make whey is described in the article above. You can replace ginger bug 1:1 for whey. Strain yogurt, as posted earlier. The liquid left is whey. Can I use a pre-bought culture starter like body ecology? thanks! Dairy Free due to allergy. How do I make this without Whey? Those options are described in the article above. In my experience, firmented juice becomes an alcoholic beverage very quickly. Does this lemonade become alcoholic? I receive some form of your question at least weekly. First, I’m wondering if you’ve ever actually tested the alcohol content in a recipe like this before? Fermented soft drinks like this one will have small amounts of alcohol. It usually ranges from .05% to 1.5% abv. Yeast-based brews (like Russian kvass, kombucha, jun, or ginger bug)will have more than one made from yogurt whey. It’s important to consider the question of alcohol as it relates to other food and drink you probably consider innocuous. For example, nonalcoholic beer usually has an alcohol content of .4%, and a ripe banana of .9%. So a drink like this will have a similar alcohol content to ripe and overripe fruit. Remember, ample research shows that small to moderate amounts of alcohol are *good* for the body. Further, you would, ideally, drink only modest amounts of any soft drink (including s naturally fermented one) and rely on water for your hydration. I would find it helpful to know where I can find fresh whey, what form it comes in and whether it is different from whey protein because when I search whey ‘protein powder’ is the only result. Hi Tracy, You can find the answer to your question by reading the post above. Do not use whey protein powder. Can I use milk kefir whey to start this? Where do you recommend getting whey from? I’m new to fermenting! Hi Jackie, that process is described above in the post. Hi there, thanks for this yummy recipe. If I wanted to use kombucha in place of the whey, how much, and when should I be adding it? Will any other part of the recipe need to be altered? I recommend replacing kombucha 1:1 for whey and making no other alterations. Once you make a batch can you reserve some as the starter or does it need to be a fresh whey (or other) starter each time? Yum! My son is on the Specific Carbohydrate Diet and he can have all these ingredients! could you use whey left over from cheese making? Your whey needs to be a source of live, active bacteria. Depending on how you made your cheese, that may or may not be the case. We recommend using whey from yogurt or kefir. Whey made after heating cultured milk and whey made by acidulating milk (both practices in some cheesemaking) will not work and should not be used. Can I use a powder kefir starter kit instead of whey? This looks so simple ! I have been shying away from trying to make my own Kombucha and other fermented drinks. I may venture into this fascinating world with this one!!! I’ve been told not to use honey when fermenting as the honey will kill the bacteria. What are your thoughts? Oh that sounds very refreshing gota try it, I’m always thirty…. and drink lots of water so something different should be good thanksgiving you Trudy!!! Thank you for the great site and recipe! Since we didn’t create the recipe you’re asking for help with, I can’t provide it. I recommend you contact the recipe author and ask them for clarification. Maybe a typo for “firm” up? does the honey have to be raw, and could you use a dehydrated cane sugar instead? I recommend making this recipe exactly as described. You can try the recipe substituting cane sugar and let us know how it goes. it just says honey. it doesn’t state whether or not it has to be raw. just wondering. Tami, raw vs. pasteurized honey won’t make a difference in this (or most recipes), but we would definitely specify one or the other if it did. What can I use instead of honey in all your recipes as I’m allergic to it? Hi Aleathe, I recommend simply avoiding recipes that contain ingredients to which you’re allergic. I’ve made this recipe w organic sugar before and it works just fine 🙂 It has taken extra days to make it ferment sometimes, but essentially it ends up tasting tangy and fizzy and delicious. Thanks for this recipe! Can I ferment it in a mason jar with the lid screwed on tight? Hi Chrissie, I recommend using the equipment outlined in the recipe. I am outside of the US and cannot find any bottles similar to the ones you use. I’m also in a very hot and humid environment so worry about trying this out with other types of jars or bottles. Any suggestions? Many people save Grolsch beer bottles and use them to effectively ferment the drink. The packaged kefir I have been using (not milk kefir) requires, during the fermentation, an opening of the bottle to release pent-up gasses. Is that true of this process? With all fermenting I worry about ‘bad’ bacteria… other than having sterile equipment how do you prevent the bad stuff? I know that for many newcomers to fermentation, there’s definitely a feeling of trepidation. It’s not necessary to sterilize equipment (clean equipment is important). Here’s the thing, fermentation inherently prevents the “bad stuff” from forming. This is why properly fermented foods are a relatively low risk for foodborne illness, especially when compared to something like prewashed salad greens, sliced melon or salsa fresca. These “bad” microbes don’t grow in highly acidic environments like those created during fermentation. When fermenting vegetables, remember to use a fermentation crock, and keep your vegetables fully submerged in brine. Follow directions for making fermented foods exactly, and really don’t sweat it. 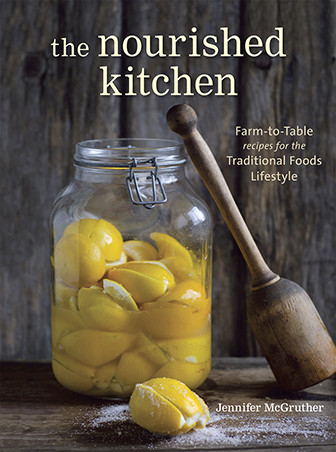 Knowledge will make you feel more comfortable so consider reading Sandor Katz’ book the Art of Fermentation. Me again! Ha! I really want to get started fermenting but have held back because of this fear. I live in a very hot and very humid environment and have no access to specialized equipment such as fermentation crocks. When I dipped my toes into the fermentation world, I started with milk kefir and got very sick from it. So many other sites say “no special equipment needed” yet I am now very hesitant to try. Any advice or links to resources for fermenting in hot climates? We see a lot of cold-climate fermented foods gaining popularity now. These include kefir, kvass and sauerkraut. My recommendation to you would be to explore those ferments that were traditionally created in HOT climates: preserved limes (Vietnam), preserved lemons (Morocco), poi (Hawaii), yogurt (Middle East). If you try other ferments, keep in mind that heat decreases, sometimes dramatically, the amount of time they need to ferment and you may get strange or off-flavors from too speedy a ferment and not enough time aging. I make my own cheese from organic fresh, non pasturized milk. Can I use this whey? How long will this keep without going bad? Or will it never go bad? It should keep 6 months, in the fridge, but keep in mind that carbonation will continue to build up – posing a risk that it may burst. So burp it if you plan to keep it longer than a week. Just answered my previous question. Burp makes so much sense, especially in warmer climes. thanks! No, 1 cup of honey is not “too much” for the probiotics. Honey, when watered down, promotes the proliferation of bacteria and does not inhibit them. I am wondering if you stirred your kombucha before you added it to the bottles? Sometimes kombucha settles, which can result in unreliable carbonation. If you stir it up before adding it or bottling it, you’ll get more reliable fizz. Also, the minimum time for this ferment is 4 days, not three, and your kitchen runs on the cooler side of room temperature so it may take longer to ferment. yes, I did gently stir up the kombucha to ensure the stuff that settles was included. the 2nd bottle I opened at day 6 was also not fizzy and was still very sweet, I haven’t tried the 3rd bottle yet… I’ll guess I’ll make another batch! maybe I’ll put the bottles atop my fridge to get things a couple degrees warmer. I think that’s a good idea – keeping it a little warmer would be a great idea, and stirring up that kombucha will yield much better results! You can probably actually just add to your current batch, rebottle, and not waste anything. After following the directions and allowing the contents to sit for 4 days I had a small amount of black mold spots and other mold rise to the top and develop in my jars. From my understanding this is NOT a good thing. Is this batch a loss? Also, why would you not recommend Mason jars? Thanks! When I read that you had mold form in “jars,” I realize that you used jars and did not follow the instructions of the recipe using the equipment recommended in the recipe (flip-top bottles). If you have mold formation, a few things could be happening 1) you used the wrong equipment, and/or 2) your whey may not have been fresh with plenty of lively bacteria. Please discard this batch, and follow the recipe using the recommended equipment and fresh whey drawn from yogurt or kefir. Mason jars are not a good fit for this because their seal is unreliable, and allows for the potential contamination of the soda with stray microbes and mold. Further, because of their unreliable seal, you’re less likely to get a solid fizz from them. Mason jars also have a larger surface area on which mold can form and, depending on how much liquid you left in the jars, if there was a lot of headspace the formation of mold is more likely. I tried this recipe, my first time attempting to make a fermented beverage. I added a little to it by adding some berries to the water and stepping them around 30 min, then stained it and allowed the water to cool down to around 100° before dissolving the honey (and a little extra coconut sugar). It’s been 4 days now, and a few bottles have what looks to be mold floating on top. Kind of off-white in color, and all the bottles have sediment in the bottom, at least I think it’s sediment, it kind of looks like it possibly could be a fungus? Not sure. I cracked open one bottle and took a sip. It smells fine, and didn’t taste bad, though there was no fizz yet. It’s important, especially when making something for the first time, that you follow a recipe exactly making no adjustments to ingredients, technique, or equipment. The addition of berries and coconut sugar are two factors that can impact the final result, especially depending on how much you added. The formation of sediment is normal, and likely higher because of the changes you made to the recipe. The creamy substance on top is likely milk solids leftover from the whey, in the event that you used cloudy instead of clear whey – and it should make no difference as to the quality of the brew. Remember also that four days is the early end of the spectrum for developing fizz. My suggestion would be to make the recipe as instructed, using the ingredients and equipment called for and making no other adjustments. Thanks, that’s encouraging. I added the berries because I found an identical recipe to this one, apart from the berries of course. It seemed like a perfect marriage, lemon-berry soda. Also, the bottle I checked was only half filed (it was what was left after filling the other bottles), would this effect the amount of “fizz” produced? When making ricotta, does the liquid you strain off that count as whey even though the milk is heated to make it separate? Your whey needs to be a source of live, active bacteria. We recommend using whey from yogurt or kefir. Whey made after heating cultured milk and whey made by acidulating milk (both practices in some cheesemaking) will not work and should not be used. Can you use goat’s milk whey from making soft goat cheese? I have made this with my daughter and there are white bits on top plus what looks like a small darker patch of mould .. Assume I need to thrown it out .. As we are also doing anti candida ? Advice ? What went wrong ? I’m curious as to whether you followed this recipe exactly, including using the equipment recommended (flip-top bottles). Your comment and experience make me wonder if you used mason jars which make ferments more prone to mold contamination. A small bit of creaminess at the top is NORMAL and a result of milk solids left in whey, especially if it was a cloudy whey, but black spot are not okay and are typically seen when people don’t use the right equipment. Also, if you’re following an anticandida diet, this recipe is really not appropriate – as it is fermented and contains a large amount of honey. I used this recipe and let the lemonade sit on the counter in flip top bottle for about 5 days. I found though that mold had developed on the top of the lemonade. And there was no carbonation. I cannot seem to get carbonation with any probiotic lemonade recipe. So a 2 part question: what would cause the mold? and how can I achieve some fizziness? Awesome, Beth! I hope you really like it. I’m glad you asked: You don’t need to let your whey come to room temperature before preparing the recipe. It should work just fine from the fridge, though it may take slightly longer to ferment. I will usually specify in a recipe if temperature of ingredients is important. I made this 5 days ago and was awoken in the middle of the night to an EXPLOSION! Yes, the bottle exploded in my kitchen – glass EVERYWHERE -the really bad news… I made 2 bottles and the other one is literally a ticking time bomb right now and I am afraid to even touch the bottle, I threw a towel over it and evacuated my children and dog from the kitchen. Beware! Hi Jeanne! Yes – fermented beverages can certainly be explosive, though it’s pretty rare. Did you check your soda for bubbles and fizz on day four? I imagine it would have been plenty fizzy then, and you could drink it or transfer it to the fridge. Bacteria love warmth, and, in warmer kitchens, fermented drinks will become bubbly faster than they will in cold kitchens. You might take the second bottle outside, and flip its top so as to relieve the pressure and prevent another explosion. Thanks for responding Jenny – yes I did flip the tops open on day 4 to relieve some pressure. Temperature in the kitchen was only 73F – I must have had some pretty strong whey LOL! I’m just thanking GOD no one was in the kitchen when it exploded. As for the other bottle, I wrapped it in a heavy towel and released the pressure – 2nd disaster averted 🙂 I would like to say the results were tasty… but after spending a couple hours cleaning up glass that made it’s way into 3 rooms and mopping up a sticky floor, counter tops and cabinets, I can only say it was OK… but it was 4am and I may have been a tad cranky! I just wanted to let you know so that this potentially very dangerous situation does not happen to someone else – thanks again. Yikes, Jeanne! You really do have some powerful whey. You’re timing’s right, and you’re kitchen’s not overly hot either. But, honestly, if I had to clean up three rooms of exploded honey soda, I think that would make it taste mighty bitter to me. It is *very* unusual to have a bottle explode, but it does happen. It happened once to us with a bottle of kombucha on a car trip, and it was super surprising. is it possible to use bottled lemon juice for this? (i.e. will contain a sulphite). Oh no, Wendi! How disappointing. If it’s not fizzy after seven days only a few things could be the culprit: 1) your kitchen might be really cold (<68 F) or 2) the bacteria in your whey might not be fresh or lively enough. Given the time of year, my money's on the second: how old was the yogurt? Bacteria in whey is most active at its freshest (within about a week of being cultured). Thank you for the reply. It may indeed have been the temperature. Last week it was only 6 celcius outside (although warmer inside!) and today it is 32 celcius outside (we are in Canada). I will try again the next time I make yogurt. As I said, it is still really tasty and the children and I are enjoying the entire process. I made ACV from scratch and have mother cultures forming. Could I maybe use either the mother culture or some acv instead of whey? I am on the AIP and any dairy is a no-no. No, I recommend making this recipe using the ingredients listed, and following the instructions listed. My bottles are 4 days old, and while both have some sediment in the bottom which I think is probably normal, neither of mine have the milk solids floating on top as others described, but one has a little light colored spherical floating ball on top! Is that a bad sign, or what might it be from? Hi Nick! The blob might be yeast or whey, and it should be fine but you’re welcome to send us a picture at support@nourishedkitchen.com. All was well! Thanks for sharing this very nifty recipe. Ill be heading to my Co-op tomorrow to grab some yogurt to make fresh whey for this recipie. Ive never made a honey ferment before. Excitied to share with my boys!! Liked this one. Made according to recipe. But it was a little too much sugar for my liking (I stopped fermenting it when the top of the gallon ball jar I was using looked like it was going to pop off.) I suppose I could have fermented it longer, but I think I may experiment with a slightly less juice/honey to water ratio next time. But very tasty all the same. Thanks! Looks great. Is there any reason I can’t use ginger bug rather than whey? I have a gb culture I’ve used for a while for ginger ale, but want to branch out to other sodas. Ginger bug is mentioned above as an alternative to whey. Ah, I should have read more closely. Thanks. Just wondering how much headspace to leave when filling the bottles. I usually fill about half-way up the neck of the bottle. Is the liquid left over from making paneer (indian cheese) the same as whey you describe. Thank you. Is it possible to use a different type of bottle? I only recommend flip-top bottles. I’ve strained some whey out of some store bought vanilla yogurt. Will this whey work for the recipe? And do I have to use the flip top bottles or can I use mason jars? Also, should the liquid be filled to the tippy top of the glass bottle or leave a bit of room for the bubbling to happen? I wouldn’t recommend vanilla yogurt, but you could try and let us know how it goes. I recommend using flip-top bottles, filling them to about half-way up the neck. I don’t recommend mason jars. Hi! Made this recipe (fresh organic lemons, whey strained from store-bought organic yogurt, flip-top bottles) and got lovely, super fizzy soda after 4 days. However, when poured into a glass and effervescing it has a fairly strong smell of ammonia (like a perm). It does not come as through as strongly in the flavor but am wondering if this is expected. I know that some lacto-bacteria can produce ammonia such as in Brie cheese but wanted to see what you thought. I have refrigerated half the bottles and left half out to see how they might change. Many thanks; love the site and the book! I’ve never had any ferment smell of ammonia. When I make this lemonade, it smells faintly beer-like. this definitely not beer-like or even like what they might describe as funky in cider-making. the best way I can describe it is like a perm smell in a salon. just thought someone might have some insights into anything being produced in a ferment. the whey was not perfectly clear when I used it and resulted in some sediment in the soda but nothing strange. could the strain of bacteria in a specific yogurt make a difference? I used Horizon brand (which might be part skim). I will try again with some Nancy’s Whole Milk Organic. It could definitely be something in the culture. My homemade yogurt was originally started with Nancy’s. It might make a big difference. Hi Jenny, Thanks so much for such an informative blog!!! I ordered some flip top bottles & was wondering how you sterilize them for the first time and after each use? What can I use if I don’t have the flip top bottles? Can I use mason jars with lids? Hi Jenn, we recommend flip-top bottles. If you use different equipment, please expect that your results may be different. Jenny Thank you so much for this wonderful recipe! Delicious! My kids loved it! I LOVED it! I made 3 bottles. I opened the first bottle after 4 days and it was not fizzy and too sweet. Then I opened the second bottle after 7 days. I only slightly tilted it before I opened it and it POPPED like Champagne and lemonade was flying off everywhere! It was a sticky mess to clean. I was super cautious with the 3rd bottle. And releasing the cap very slowly and all was good. My question is, people mentioned about “burping” the bottle. If I flip open the bottles once a day after day 4, would that affect the fermentation? What’s the best way to prevent an explosion like others mentioned? I’m so addicted to this lemonade soda! Burping the bottles is a good way to check to see if they’re fizzy, but if you burp too often, you’ll lose your fizz entirely. Do you recommend giving this a light shake before pouring or leaving the sediment at the bottom? I wouldn’t bother with shaking. Have been interested in fermented sodas for a while and had tried a couple of very complicated and ultimately unsuccessful recipes before so, I’m very excited to find this clear and easy to follow recipe. Thanks for sharing. Will try it as soon as the weather warms up (winter here) and the lemons are back on the tree. I just opened my first bottle. 7 days at room temp and 1 day in the fridge. I am so super impressed and excited. This sh*t is SO GOOD! I can’t wait to make lots and lots more. Hopefully I’ll move on to kombucha and water kefir next. xo. Loved your blog. Thanks for giving another product to use instead of whey! Those of us with whey allergy’s appreciate knowing what to use in place of the whey. I think that should work as long as it has live, active cultures. Some storebought kombuchas are pasteurized and then carbonated. Do you have to use the specific flip-top bottles for this recipe … can a canning jar with the two piece lid be used instead?! I appreciate any suggestions you have … thank you! I recommend using a flip-top bottle, but you could try a mason jar and let us know how it goes. I have made several batches of this probiotic lemonade. Unfortunately, the last 3 batches have had mold floating at the top of the flip-top bottle. I have warmed the honey and water (and cooled prior to adding to whey), and this last time I heat processed the bottles before using them to bottle the finished liquid. Does this mold mean my batch is no good? How do I eliminate mold in my ferment? Maybe coming from the lemons, as they were never heat treated? Thanks for you help!! I’ve never had a problem with mold in years of making this, though some people seem to. Try sterilizing your bottles. Also, sometimes the milk solids in the whey coagulate and float to the top of the ferment and they look like mold, but aren’t. Hi! So I did this and got mold in mine after 3 days. Any idea what I did wrong? Maybe give a look to the comments above. If you’ve followed ALL of the instructions and used the ingredients and equipment listed, someone pinpointed that not using sterilized equipment. This is my first time experimenting with fermentation. I followed the recipe, using ginger bug. The lemonade has been sitting on my counter in a flip top bottle for 3 days now. Is it normal for there to be a layer of cloudiness on the bottom of the container? Thanks for your help, and what looks like a yummy recipe! It’s normal to get a bit of sediment. I have made this and it is delicious, thank you for the recipe. How long would the lemonade last in the fridge? We usually drink it within a week. Hi! Thanks for the post! I’m just wondering does kombucha make for a better lemonade, or using whey from yogurt? What are the differences in final product?I have been on a fermentation kick lately and have both homemade yogurt and kombucha! Thanks! Does whey have the milk protein in it that causes problems for dairy allergy? I am nursing a baby with a dairy allergy. Is there an alternative to using whey? I would recommend you avoid whey if you are nursing a baby sensitive to cow’s milk protein. The good news, though, is that most babies will outgrow the sensitivity around 6 months. The picture of the end product with the lemonade in its glasses with the slices of the lemon is so aesthetic. It looks so unbelievably refreshing and like a summer drink to please the entire family! Thank you for sharing this recipe I can’t wait to try it at home. My kids will love it! I made the lemonade as directed using milk kefir whey. It developed a mother in it and I’m wondering what to do with it? Do we drink it, mix it up with the lemonade or should I strain it out? I have a great tip for dissolving honey that does not involved heating (and washing the saucepan)! Put the honey and whatever liquid you want to mix it with into a jar and shake it!! It will dissolve, and then you can pour it into your flip top bottles. Laziness led me to this discovery! Love your website and really love this recipe. My fiance enjoyed it so much, that he had three glasses of it (mixed with lots of ice)!! I am now trying the recipe with limes to see if it will make a nice limeade. I bet it would make a great limeade! Just tried it today, it’s delicious! I wonder now if any citrus would work (blood orange might be awesome)! LOVE this recipe! We made this last week and we are making it again. Awesome way to get those probiotics in and the kids love it! This is so cool! I never knew how to ferment lemonade before. I don’t know how to make kombucha or have the starter for it, but I make yogurt all the time and can get whey easily! Very excited to try this! Can I use a mason jar instead of a flip top bottle? I like to use what I have on hand! Thank you! You can try and let us know how it goes, but most of the commenters who have had problems were using mason jars. I made this Lemon Soda a few days ago while preparing for hurricane Irma. I figured I would have at least something to look forward to after it hits us here in Central FL. :). I will post on how it came out. There is some really funky looking stuff floating on top. Not mold just weird looking cloudy stuff. I make kombucha, so I am used to seeing strange looking things during fermentation. Thanks for the awesome looking recipe. Wish me luck…..
Hello, just wandering if it’s suitable for low carb diet. Thank you. Firstly, I love the site and all of the cool information! I am not a newcomer to cultured foods; I’ve got a wonderful 85 year old sourdough that I got from my mother, and have kept it alive successfully for 4 years, making pancakes and bread all the while. I’ve also fermented bananas, made apple wine, naturally fermented apple cider, and cultured yogurt. I have been trying to get a fermented soda off of the ground without success for awhile now. I’ve not yet tried this particular recipe (lemomade), but rather your root beer recipe (which I adore). This question concerns the starter. I’ve tried ginger bug several times: First time, used regular Ginger from China, learned later it has been irradiated and is dead… Second, third, and forth tries the ginger bug showed promise for a few days but after day 3 or 4 it’s simply goes flat. Warming it up, adding more sugar and water and Ginger… nothing seemed to do the trick.. I’m using organic Ginger root and dechlorinated water, I’m not sure what else to do. I’ve tried kefir as per your recipe twice, and most recently, fresh whey that I got from making my own raw milk yogurt. Neither of them resulted in fermentation. I did make one change to the root beer tea recipe, as I could not locate or source Wintergreen. I substituted Spearmint leaves for the Wintergreen. I have been doing a little digging on this and it appears that Spearmint may have antibacterial qualities. Do you know if they would be strong enough to inhibit fermentation ? I was recently able to find some Wintergreen and have ordered it, once it arrives I will try again. I know you receive a lot of questions and I’m sure you get frustrated with people asking about things that have been covered either in the recipe itself, links provided in the recipe, or in the comment section. I’ve tried to do my due diligence on this, so if I’m asking something that’s already been covered I apologize. I’d love.to hear your thoughts. One thing I would check is the temperature of your home. If it’s too cold, fermentation won’t take place. Also, in using whey, if you fermented your yogurt or kefir for a very long time, it may actually lack sufficient bacteria because they will have started to die off due to lack of food. The ginger bug is tricky, and a couple people have had trouble with it but I haven’t yet had a chance to troubleshoot their issues as it does work consistently for me. I have a kevita. Could I use that as a starter or will it not work since it has flavors added and is already carbonated? I used some raspberries should I purée them ? Making my 2nd whey leminade. It’s been on counter a couple of days. Today I noticed foam (or mold?) on the top. How do I determine if safe? So I hesitantly tried this, because I’d love to start fermenting but it scares me. My lemonade sat out 4 days and at the bottom this white cloudy stuff formed. Now I shook it up, smelled and tasted it. It smells hintishly like beer and tasted fine, it actually tasted good! Does this mean it’s ok? Or is the white wispy stuff a bad sign. The stuff at the bottom of the bottle is sediment, and is normal in home-fermented sodas and cultured drinks! Can you use a mason jar with a tight fitting lid or do you have to use that type of bottle ? I recommend using the equipment specified in the recipe for best results. Could I use water kefir made from kefir grains instead of whey?